Mukesh Dhirubhai Ambani is an Indian business magnate, the chairman, managing director, and the largest shareholder of Reliance Industries Limited (RIL), a Fortune Global 500 company and India's most valuable company by its market value. According to the Forbes magazine, he is the richest Asian and the 13th richest person in the world as of March 2019. Roberto Cavalli is an Italian fashion designer and inventor. He is known for exotic prints and for creating the sand-blasted look for jeans. The high-end Italian fashion house Roberto Cavalli sells luxury clothing, perfume and leather accessories. Former Acne Studios creative consultant Paul Surridge succeeded Peter Dundas as creative director for the brand in May 2017. Ralph Lauren, KBE is an American fashion designer, philanthropist, and business executive, best known for the Ralph Lauren Corporation, a global multibillion-dollar enterprise. He has also become well known for his collection of rare automobiles, some of which have been displayed in museum exhibits. Lauren stepped down as CEO of the company in September 2015 but remains executive chairman and chief creative officer. As of 2018, Forbes estimates his wealth at $7.2 billion, which makes Ralph Lauren the 91st richest person in America. The Punjabis or Punjabi people are an ethnic group associated with the Punjab region in South Asia, specifically in the northern part of the Indian subcontinent, presently divided between Punjab, India and Punjab, Pakistan. They speak Punjabi, a language from the Indo-Aryan language family. The name Punjab literally means the land of five waters in Persian: panj ("five") āb ("waters"). The name of the region was introduced by the Turko-Persian conquerors of the Indian subcontinent. The historical Punjab region is often referred to as the breadbasket in both India and Pakistan. Hindus are persons who regard themselves as culturally, ethnically, or religiously adhering to aspects of Hinduism. Historically, the term has also been used as a geographical, cultural, and later religious identifier for people living in the Hind. 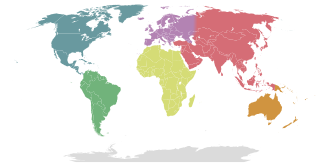 However, the term was popularized by the Colonial British government after the 1871 census of colonial India, the term was used to create divisions in the Indian society on religion lines, especially in the aftermath of the 1857 revolution. The term "Hindu" is not used in any of the religions texts of India including the Vedas. Farah Khan, also known by her married name Farah Khan Kunder, is an Indian film director, film producer, actress, dancer and choreographer best known for her choreographic dance work in numerous Bollywood films. She has choreographed dance routines for more than a hundred songs in over 80 Hindi films, winning six Filmfare Awards for Best Choreography and the National Film Award for Best Choreography. In addition, she has worked on international projects, such as Marigold: An Adventure in India, Monsoon Wedding, Bombay Dreams and the Chinese films Perhaps Love and Kung Fu Yoga, earning Tony Award and Golden Horse Award nominations. She has since become a film director as well, with a Filmfare Best Director Award nomination for her directorial debut Main Hoon Na. Main Hoon Na(English : I am here) is a 2004 Indian action-comedy film, co-written and directed by Farah Khan in her directorial debut. The screenplay was written by Farah Khan and Abbas Tyrewala based on the story by Anvita Dutt Guptan. The film stars Shah Rukh Khan, Zayed Khan, Sushmita Sen, Amrita Rao and Sunil Shetty. Amisha Patel and Ayesha Takia were the original choices for Amrita Rao’s role. It was remade into Tamil as Aegan starring Ajith Kumar, Nayantara and Pia Bajpai. Established in 1985, Satya Paul is India’s premier design label. The brand is acclaimed for ingenuity in its design sensibility and a vivid color palette. The brand has grown from strength to strength and is now present at over 36 locations in India and select high street boutiques abroad. Satya Paul also has a strong presence with its e-commerce portal satyapaul.com and presence on all prominent e-commerce websites namely Amazon, Myntra and Jabong. Bandra is a coastal suburb located on Salsette Island in Maharashtra, India. The suburb is located to the immediate north of the Mithi River, which separates Bandra from Mumbai City. It is the third-largest commercial hub in Maharashtra, after Mumbai and Pune, primarily aided by the Bandra-Kurla Complex. Additionally, many personalities who are active in Bollywood, cricket, and politics reside in the city. Sussanne Khan, formerly known as Sussanne Roshan is an Indian interior fashion designer. Vadodara is the third-largest city in the Indian state of Gujarat, after Ahmedabad and Surat. It is the administrative headquarters of Vadodara District and is located on the banks of the Vishwamitri river, 141 kilometres (88 mi) from the state capital Gandhinagar. The railway line and NH 8 that connect Delhi and Mumbai pass through Vadodara. It is known as a Sanskari Nagari (city) of India. Worli is a locality in the city of Mumbai, Maharashtra. Historic spellings include Warli, Worlee, Varli. Originally Worli was a separate island, one of the Seven Islands of Bombay which were ceded by the Portuguese to England in 1661; it was linked up with the other islands in the 19th Century. Maison et Objet is a major French trade fair for interior design. Held bi-annually in Paris Nord Villepinte Exhibition Center, it has been described as "among the 3 most important European events for interior design ... a huge collection of innovation and talent all in one place." In 2017, Khan curated a collection of designer lights for TISVA, a premium home decorative lighting brand from Usha International Limited which introduced smart-control magnetic systems—launched for the first time in India. Bottomline Media handles her brands and has worked with her from beginning on brands such as satya paul ,Steinway,villeroy and Boch Tisva to name a few . Kal Ho Naa Ho, also abbreviated as KHNH, is a 2003 Indian romantic comedy-drama film directed by Nikkhil Advani. The film features Jaya Bachchan, Shah Rukh Khan, Saif Ali Khan, and Preity Zinta as the lead characters, with Sushma Seth, Reema Lagoo, Lillete Dubey, and Delnaaz Paul in supporting roles. It narrates the story of Naina Catherine Kapur, a pessimistic and uptight MBA student. She falls in love with her neighbour Aman Mathur, a terminally-ill heart patient who tries to get Naina and her friend Rohit Patel to fall in love with each other, since he fears she will grieve for him if he reciprocates her feelings. Divya Bharti was an Indian film actress, who starred in a number of Hindi and Telugu motion pictures in the early 1990s. Known for her acting versatility, vivacity and beauty, she is regarded as one of the most popular and highest paid Indian actresses of her time. Rab Ne Bana Di Jodi, also known as RNBDJ, is a 2008 Indian romantic comedy film written and directed by Aditya Chopra and produced by Yash Chopra and Aditya Chopra under the banner Yash Raj Films. The film stars Shah Rukh Khan and newcomer Anushka Sharma in the lead roles. Khan plays a mild-mannered office worker named Surinder Sahni, whose love for the beautiful and vivacious Taani causes him to transform himself into the loud and fun-loving "Raj" to win her love. It was released worldwide on 12 December 2008 and marked Aditya Chopra's return to directing after an eight-year break, following his previous film, Mohabbatein. "Chammak Challo" is a song performed by Akon and Hamsika Iyer, and composed by music director duo Vishal-Shekhar and by Gobind Singh, as a part of the soundtrack for the 2011 Bollywood film Ra.One. It is Akon's first musical collaboration with Indian artists. There are four other versions of the song in the album, including a remix by Abhijit Vaghani, another remix by DJ Khushi and an international version sung solely by Akon. The song, along with the rest of the soundtrack, was officially released on 12 September 2011. However, the song faced controversy when the rough version was leaked on the Internet on 31 May 2011. Dhanak is a 2016 Indian Hindi film written and directed by Nagesh Kukunoor. Produced by Manish Mundra, Nagesh Kukunoor, and Elahe Hiptoola, the film features Hetal Gada and Krrish Chhabria as the two children, playing brother and sister, in the leading roles, with supporting performances from Chet Dixon, Vipin Sharma, Gulfam Khan, Vibha Chibber, Flora Saini, and Vijay Maurya. The film was released nationwide in India on 17 June 2016. Raees is a 2017 Indian Hindi-language action crime film directed by Rahul Dholakia and produced by Gauri Khan, Ritesh Sidhwani and Farhan Akhtar under their banners Red Chillies Entertainment and Excel Entertainment. It stars Shah Rukh Khan, Mahira Khan and Nawazuddin Siddiqui. Raees was said to be based on criminal Abdul Latif's life. However, the filmmakers denied this, stating, "The story of the film is a pure work of fiction, not based on any person; living or dead." Waluscha De Sousa is an Indian model and a film actress. She made her debut as a female lead opposite Shah Rukh Khan in the 2016 Hindi film Fan produced by Yash Raj Films. 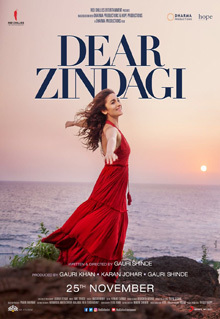 Dear Zindagi is a 2016 Indian Hindi-language coming-of-age drama film written and directed by Gauri Shinde. 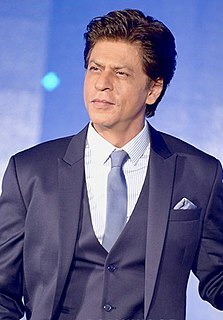 It was produced by Gauri Khan, Karan Johar, and Shinde under the banners of Red Chillies Entertainment, Dharma Productions, and Hope Productions respectively. The film features Alia Bhatt in the lead role, with Shah Rukh Khan, Kunal Kapoor and Ali Zafar in supporting roles. The plot centres on a budding cinematographer named Kaira, who is discontented with her life and meets Dr. Jehangir, a free-spirited psychologist who helps her to gain a new perspective on her life. Jab Harry Met Sejal is a 2017 Indian Hindi-language romantic drama film written and directed by Imtiaz Ali. It stars Anushka Sharma and Shah Rukh Khan, their third collaboration after Rab Ne Bana Di Jodi (2008) and Jab Tak Hai Jaan (2012). Pre-production of the film begun in April 2015 and principal photography commenced in August 2016 in Prague, Amsterdam, Vienna, Lisbon and Budapest. 1 2 3 "I don't want to make my business mass: Gauri Khan". www.fortuneindia.com. Retrieved 2 January 2019. ↑ "Gauri Khan revamps Jacqueline Fernandez's apartment, shares pics on Instagram". Hindstan Times. 16 June 2018. Retrieved 2 January 2019. ↑ "Gauri Khan designs Sidharth Malhotra's new home, Shah Rukh says they stole his hammock". Hindstan Times. 6 November 2018. Retrieved 2 January 2019. ↑ "Shah Rukh Khan calls wife Gauri their family's 'fortunate, most powerful' as she features on power list". Hindustan Times. 27 November 2018. Retrieved 2 January 2019. ↑ "Gauri Khan Biography". Movies Dosthana. Retrieved 7 March 2016. ↑ "Gauri Khan". PlanetSRK – ShahRukh Khan discussion forums & community. Retrieved 8 December 2016. ↑ "Gauri Khan turns model". Sify.com. 17 January 2005. ↑ "Cocktails and dreams: Satya Paul, Gauri Khan launch their new collection". Cocktails and dreams: Satya Paul, Gauri Khan launch their new collection. 1 2 "Gauri Khan turns designer". Times of India (indiatimes.com). 10 July 2011. ↑ "Sussanne Khan, Gauri Shinde feted as women achievers". The Indian Express. 8 April 2017. Retrieved 19 May 2018. ↑ "A synonym for talent". DNAINDIA.com. Retrieved 22 May 2018. ↑ "My Design is a Reflection of My Creativity: Gauri Khan". Khaleej Times. Retrieved 22 May 2018. ↑ Crossley, FashionNetwork.com,Isabelle. "Gauri Khan launches design store in Mumbai". FashionNetwork.com. Retrieved 16 February 2018. ↑ "Everything you need to know about Gauri Khan's new design store". vogue.in. Retrieved 22 May 2018. ↑ "Gauri Khan's decor advice is a must-read for anyone redoing their home". Inhome.rediff.com. 18 December 2017. ↑ "Gauri Khan receives Excellence in Design Award". Times Of India. Retrieved 22 May 2018. ↑ "Gauri Khan lights up the house with TISVA's new collection". Architectural Design | Interior Design | Home Decoration Magazine | AD India. 28 August 2017. Retrieved 26 June 2018. ↑ "Gauri Khan is Vogue's cover girl". Rediff.com movies. Inhome.rediff.com. 18 December 2007. ↑ "SRK, Gauri walk the ramp for KJo". Movies.ndtv.com. Archived from the original on 19 October 2009. Retrieved 7 February 2012. Wikimedia Commons has media related to Gauri Khan .